Snappy Super Boat Cleaner contains advanced tensides and chelating agents in a proportion that makes this product the ideal all around cleaner. Spray on and wipe off dirt. Safe for all surfaces. 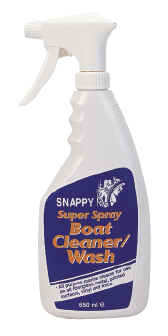 Snappy Super Boat Cleaner can be used diluted as a boat wash or as a concentrated spray to clean those really dirty areas. Even great around the house.